School board work took up much of Jim (James Verner) Waddell's spare time between 1937 and 1950. First he dedicated his time locally in Ste. Rose, then in the Province of Quebec, and finally as President of the Canadian School Trustees Association. He travelled to conferences from Victoria to Fredericton representing Quebec to other Provincial Trustee Associations and returning with ideas for improving education in Quebec. 1949-1950 : Elected as President of the C.S.T.A. and served one year of a two-year term. School board work was a natural extension of his belief in the value of education. When the family moved to Ste. Rose in 1933, there was only a one-room private school for English students with three or four grades. The school was run by Mrs. McDermott in her home. She was a British woman who had previously worked at a "toney" private school in Montreal: Miss Edgar's and Miss Cramp's.She was also the wife of Nell's ex-boss at Johns-Manville where Nell had worked before she married Jim. Mrs. McDermott mostly had preschoolers, but she had a son, Christopher, who was Joyce's age, so she taught both of them until Grade 4. Graham and Keith also attended the school. The only school in Ste. Rose, other than Mrs. McDermott's, was a Catholic French School. Jim believed the English-speaking community needed its own Protestant school to serve the families of mostly wage-earners who commuted to jobs in town as he did. The year (1937) that Joyce and Chris went off to school in Montreal, Jim started working hard for education. 1. A school board: He found out that first you had to get the Protestant ratepayers to declare themselves Protestant. Then you had to get a private member's bill through the legislature in Quebec to establish a school board. That way the school taxes that were being paid could be routed over to the Protestant Board. So he became the School Board Chairman and Harry Lambourne and 2 or 3 other people were involved. But Jim took the leadership role. 2. An appeal to the Provincial Premier, M. Duplessis, in Quebec City; He went up to Quebec City and had a very brief audience with Duplessis. "In some places there may be only the school or schools of the faith of the majority, administered by a board of five elected commissioners. However, where any number of residents in a district, of a faith differing from that of the majority, decide that they would like to have their own school or schools, they may signify their intention to do so by giving collective notice in writing to the existing board of Commissioners. They may then, under provisions of the Education Act, proceed to organize their schools and administer them under a board of three elected school trustees." By 1938, a one-room school was operational near Ste.-Rose train station in what had been a corner store in those days. It came about largely, if not entirely, due to Jim's initiative, hard work and perseverance. There was something of a library of books and they hired a teacher, Miss Spencer-Phillips, from the Town of Mount Royal. They had close to 20 kids there one year. The school ran for not much more than a year before the one-room idea killed it in favour of commuting by taxi, bus or otherwise to Ahuntsic School in Pont Viau on Montreal Island. Jim had to negotiate with the Montreal Protestant School Board for Ste. Rose kids to be accepted. By then, Joyce was already doing well in the Junior School at Montreal High School for Girls so she stayed there and took the Provincial Transport bus into town. Working towards a "Proper School"
Although the Ste. 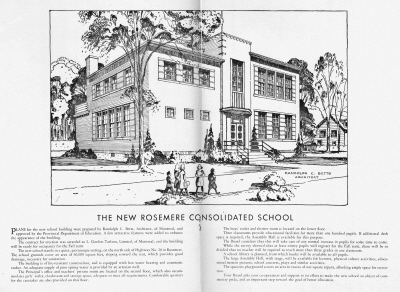 Rose school was shut down about 1939/40, Jim's school board work continued, initially to coordinate arrangements for commuting to Montreal, then to help support the construction of a proper school in Rosemere - a "comprehensive" high school - and later an intermediate school in Ste. Rose. In February, 1944, J.V. (Jim) Waddell wrote a letter to the editor of the Montreal Gazette which was published on February 21st, arguing the benefits of larger school districts particularly over "the little red schoolhouses" that had historically educated children outside of the cities. This letter can be found transcribed here. Or the original can be found on Google News Archive. To see the entire booklet click here. In July, 1945, the Protestant School Municipality of Ste. 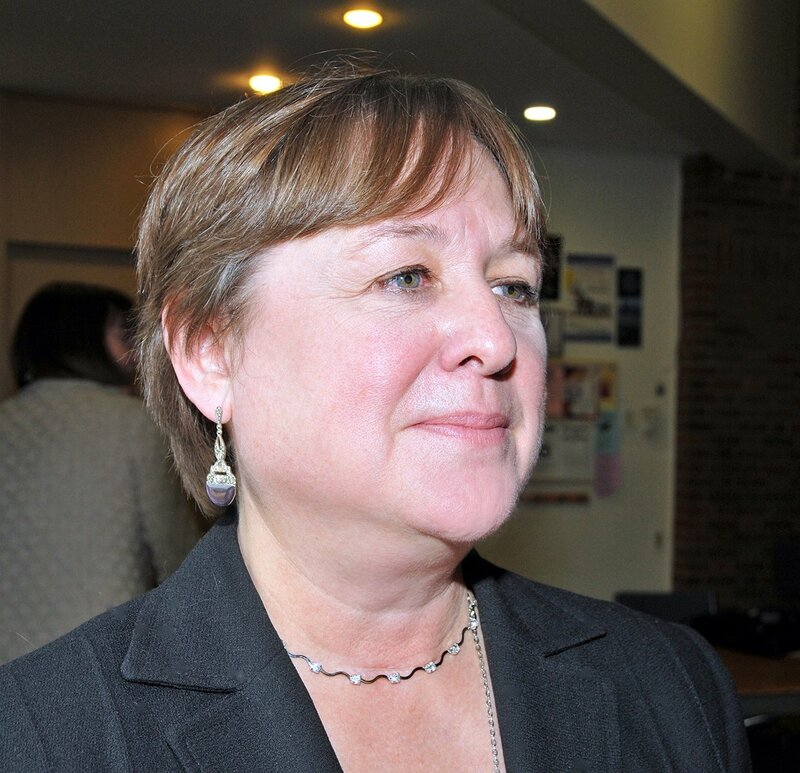 Therese de Blainville published a booklet explaining the need for a new consolidated school. The site chosen was in Rosemere in order to be able to serve the English Protestant communities of Ste. Therese de Blainville, Rosemere and Ste. Rose. -a letter from JV Waddell as Chairman of the Protestant Board of School Trustees of Ste. Rose (Diss.). In his letter, Mr. Waddell states, regarding the previous arrangement for Ste. Rose English Protestant students, "In 1938 this Board considered the problem of building a one-room school and as an alternative, through the co-operation of the Montreal School Board, was able to arrange for the education of its pupils at Ahuntsic school in Montreal." Furthermore, since "this agreement did not meet with the approval of all parents, this Board decided...to enter into an agreement...for the purpose of sending Ste. Rose pupils to the new consolidated school." Jim was hooked on school board work. He must have toiled an hour or three almost every evening on School Trustees work. From the local school board work he became involved in the School Trustees Association of Quebec whose function was to help maintain uniform policies in a lot of details regarding school administration, curricula, and so on. By 1947, Jim had become President of the Canadian School Trustees Association which was established to promote consistency among provincial education systems. School Board and Trustee work was very time consuming for both Nell and Jim. (All correspondence had to go by what we now call "snail mail". )Jim would draft his letter long hand, after which Nell had to read and type from his draft - very difficult.